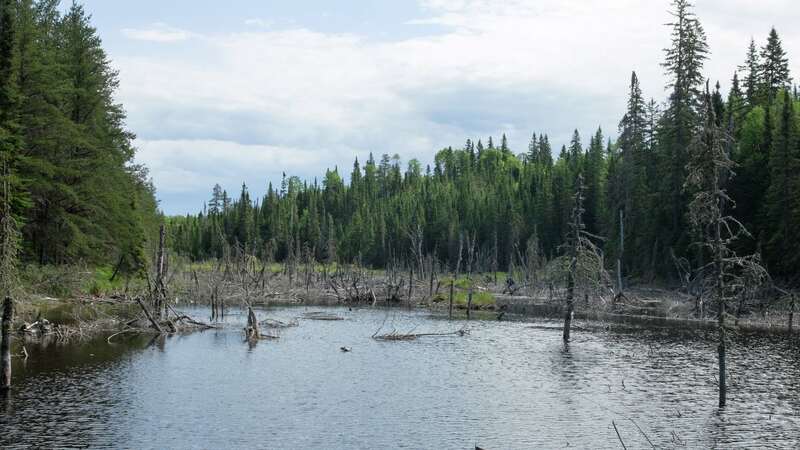 time: start – 8:30 a.m. ; finish – 3:00 p.m.
P2 RL – 560m – dry (muddy) lake bed for about 260m followed by lineable stream section of about 300m; followed by beaver dams, then lineable rocky sections. As always this will vary based on water levels. 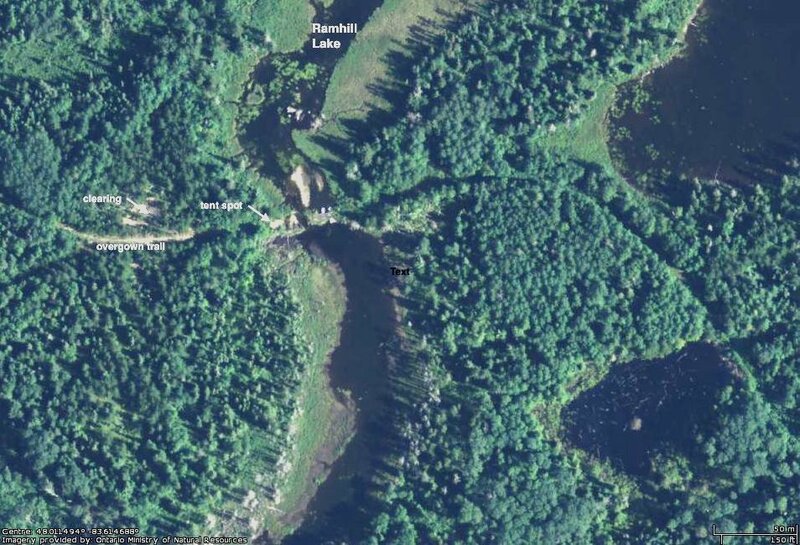 It could turn into a 1000 m + portage!! 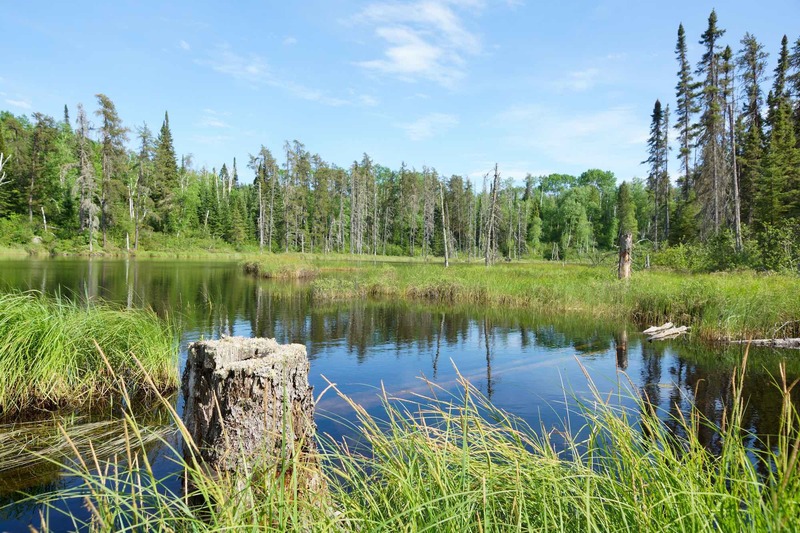 P4/LO – 10m around or over the mini-beaver dam stretched between the two sides of the overgrown road. 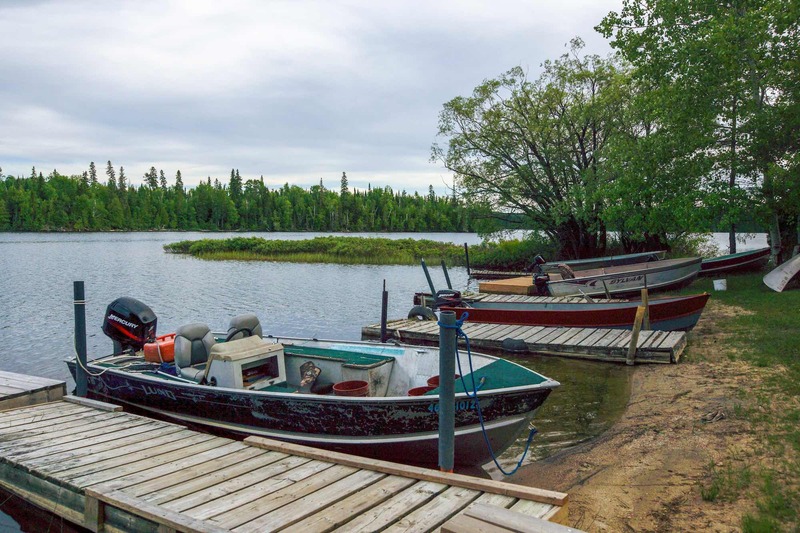 We were at the dock and on the water by 8:30 and it would be overcast for the first part of the day as we made our way to the headwaters of the Little Missinaibi River. 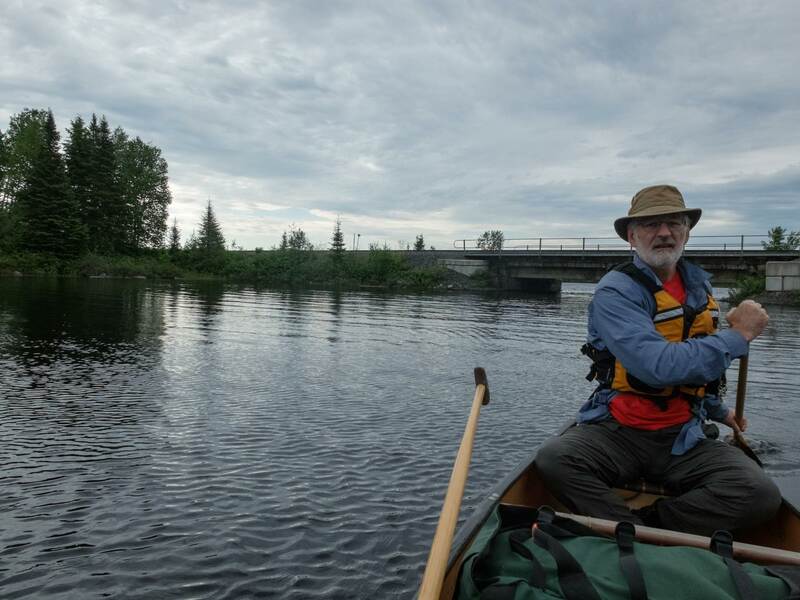 When we paddled under the railway tracks we were officially in the Chapleau Crown Game Preserve, apparently the world’s largest. Who knew! 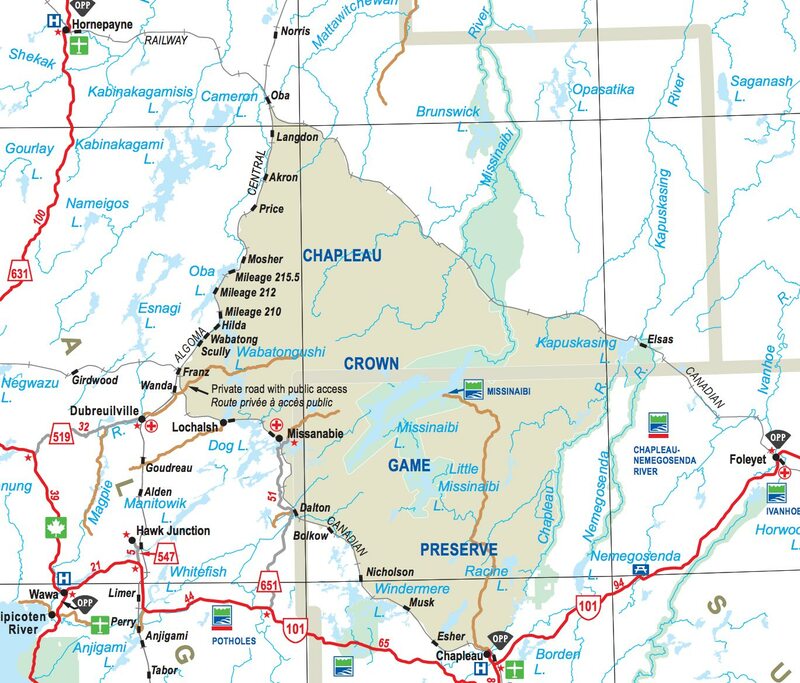 Founded in 1925, its boundaries are the Chapleau River on the east, the CPR tracks that we were limbo-ing under on the south, the old Algoma Central tracks on the west, and the CNR tracks on the north side. See the map below for some context. 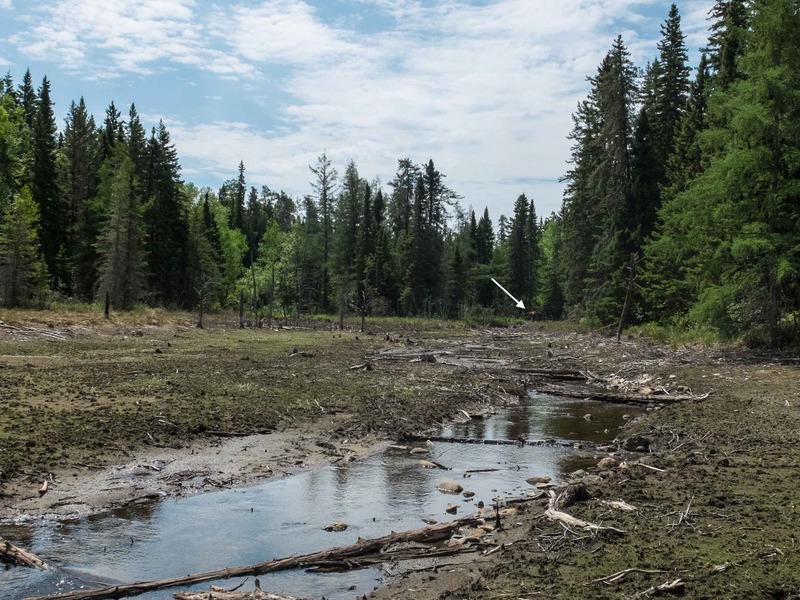 While hunting and trapping are not allowed (except by those indigenous people who choose to by Treaty right), clear-cut logging does continue. 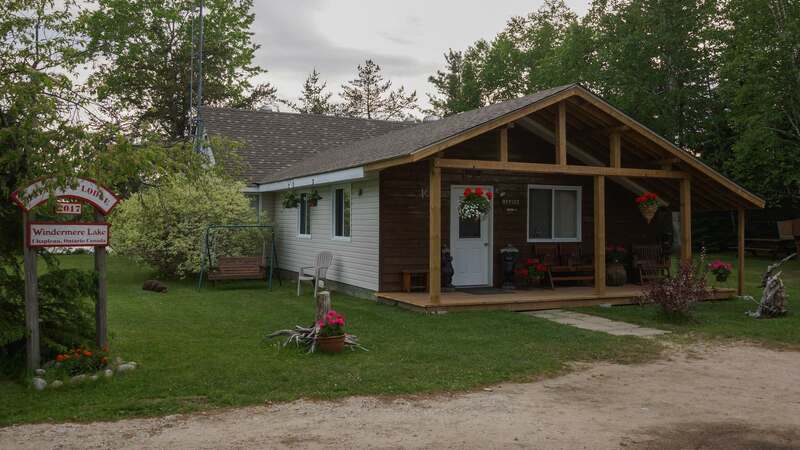 There is also a road from Chapleau that goes right to a campground at the heart of the Preserve on Missinaibi Lake’s Barclay Bay. 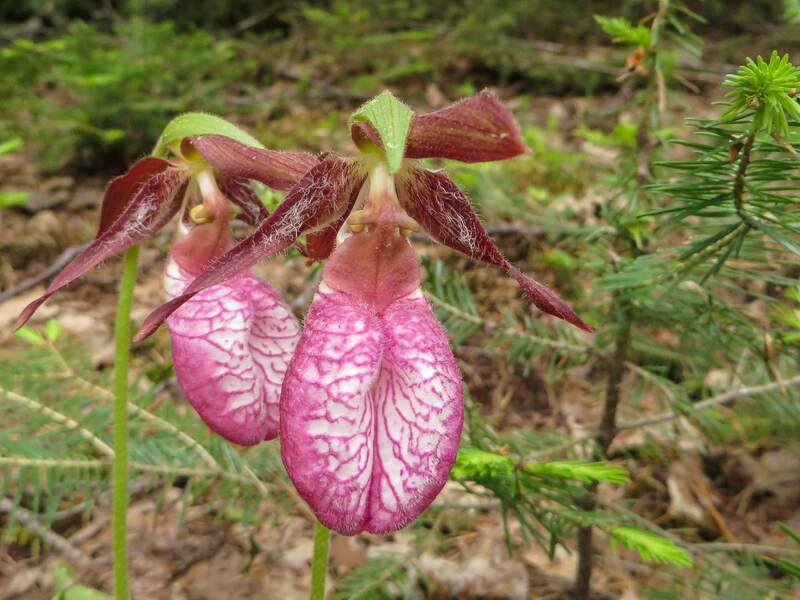 The area around the lake – and Little Missinaibi Lake – is also a part of Missinaibi Provincial Park. 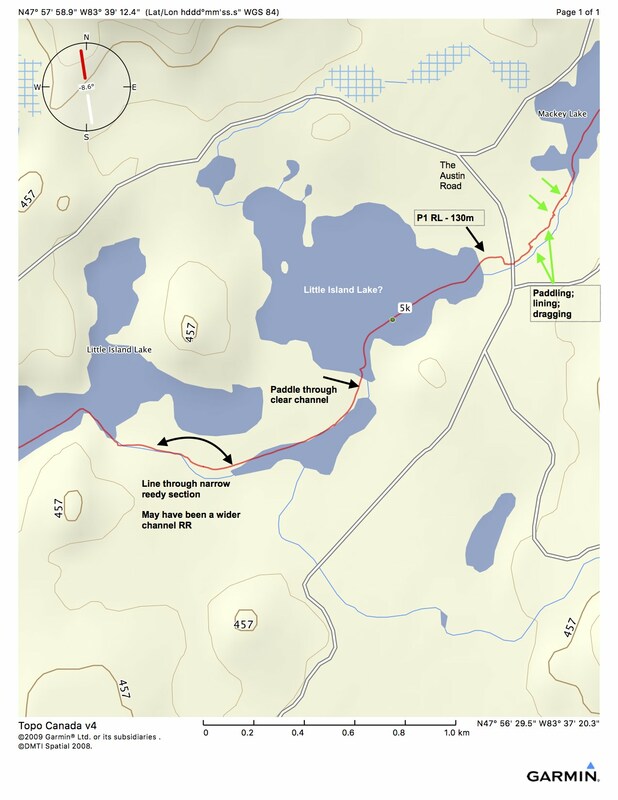 An easy half hour paddle to warm up and then we were faced with our first unknown – the passage from the southern section of Little Island Lake to the top of the lake. 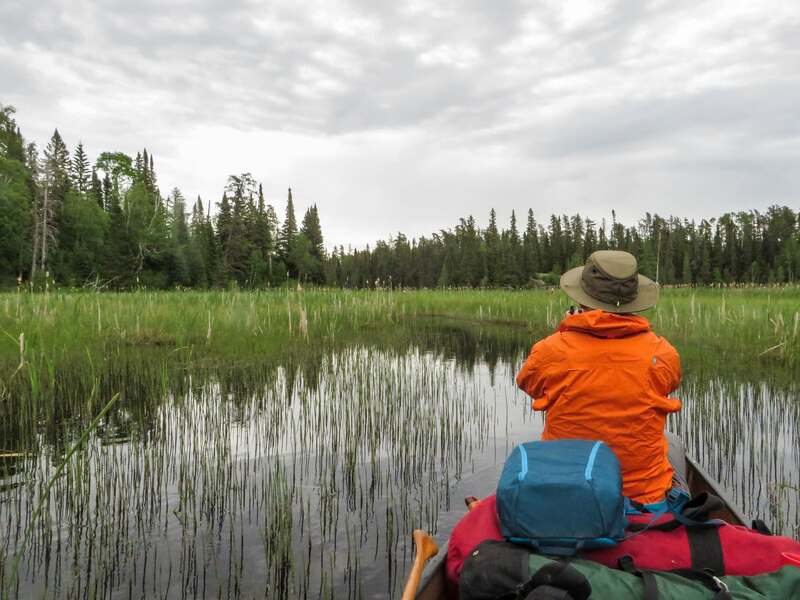 We found a reedy shallow passage and spent fifteen minutes lining and walking and dragging the canoe to some water we could dip our paddles in. 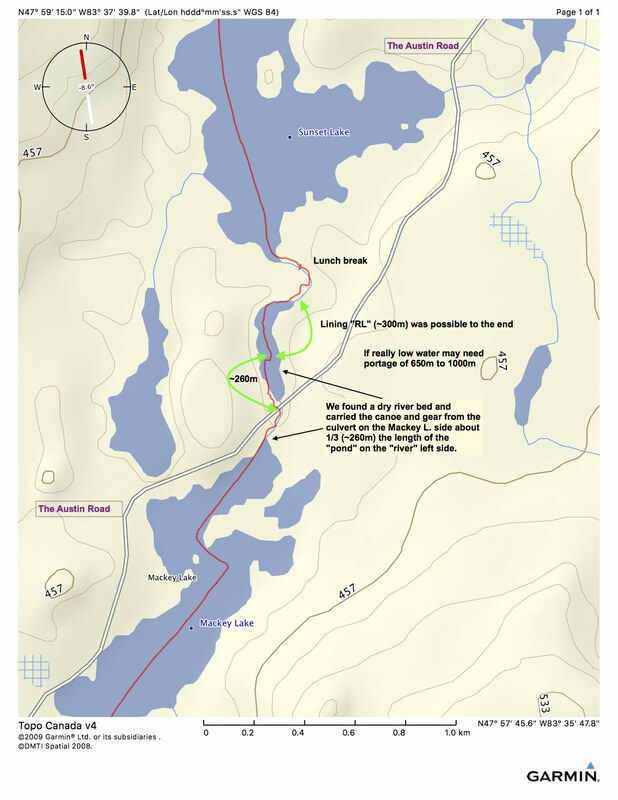 The map and images below show the terrain. After that it was easy paddling to the top of Little Island Lake . 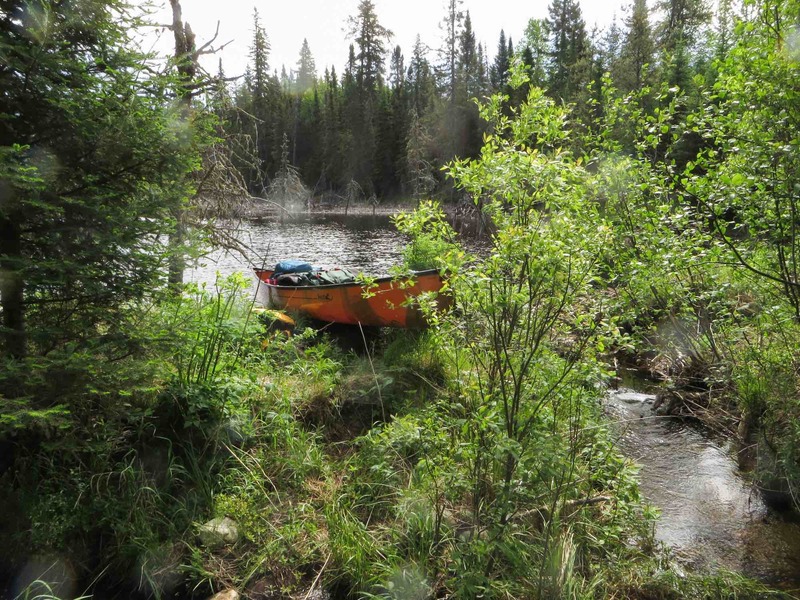 Thanks to the aluminum canoe and the motor boat shell sitting on the shore, we found the trail going up to the Austin Road from the lake. On the other side of the road we walked the canoe and gear down to some water. The trip was less than two hours old when Max already scored his first flower shot! 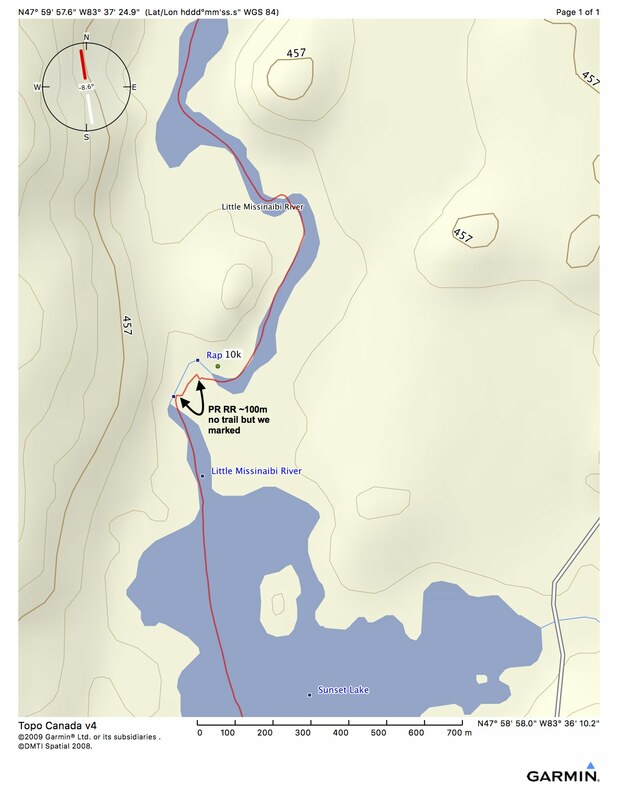 Then we spent an hour and a quarter dealing with the 440 meter distance to get into Mackey Lake – paddling, lining, dragging our way. When we first got our pricy composite Kevlar/carbon fibre Swift Dumoine we were determined to prevent scratches. 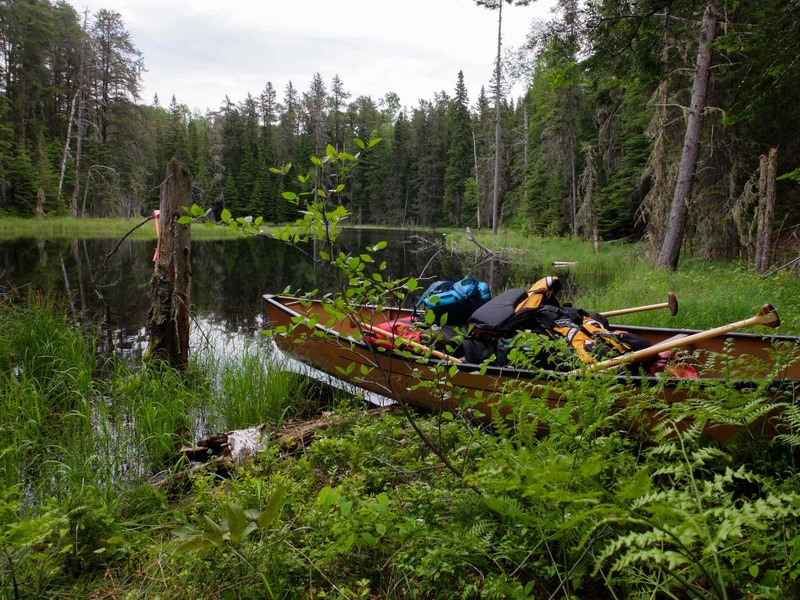 On its first trip – the 2012 Kopka – we brought along a 2′ x 4′ plastic sliding platform – aka “the magic carpet” – which we placed in crucial spots to help with dragging the canoe over logs and beaver dams and other impediments. While the initial motivation may have been to reduce scratches, we soon realized that was hopeless and came to accept the scrapes as a price of the journey. However, we also came to appreciate how it made dragging the canoe so much easier! You’ll see it at work in a few pix – like the one below as we make our way to Mackey Lake. A leisurely thirty minute paddle up Mackey Lake to our next unknown, the passage into Sunset Lake. 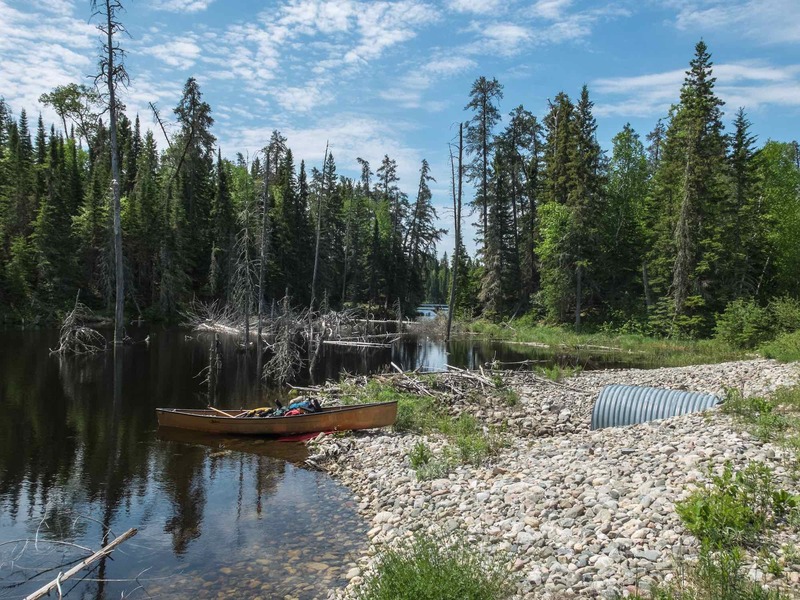 Mackey Lake would seem to be the headwaters of the Little Missinaibi River but its flow into Sunset Lake has been blocked by a makeshift gravel and rock wall around the culvert connecting the two lakes and going under the logging road. 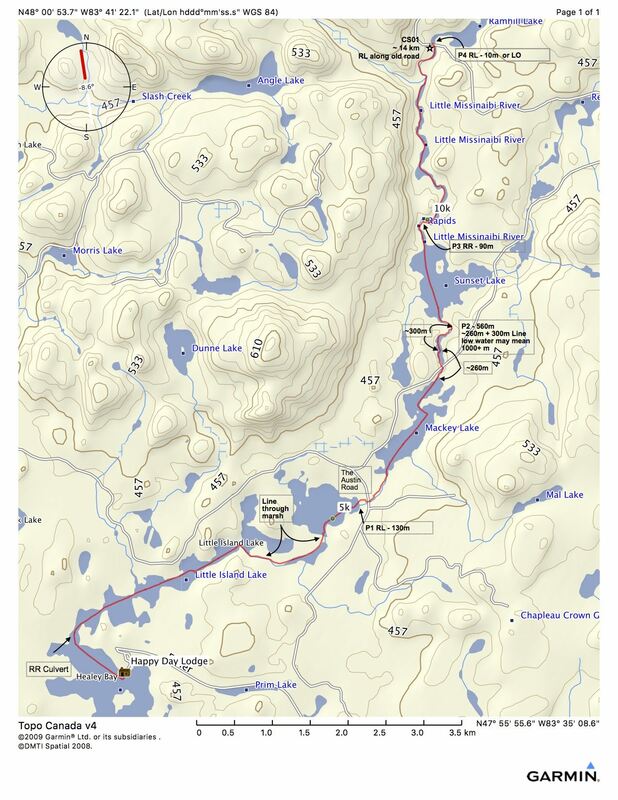 We beached the canoe and walked across the logging road expecting to see the long narrow pond shown in the Garmin topo map. Instead, we saw about 300 meters of dry riverbed. Portage time! We followed that up with some lining and paddling when the water was deep enough. In the image above the little dot you see a bit right of center is Max doing a double bag carry to the end of the dry section. It was Day One so we were at our heaviest. Given our carry-and-a-half system, I follow with a similar load and drop it at the half way point and then return for the canoe and camera bag while Max returns to the half-way point and picks up the bags I have dropped. The portage is done when I get to the end with the canoe. We know we have done a good job guessing the half way point when we arrive together! It took us about an hour to deal with the portage and lining from Mackey to Sunset. 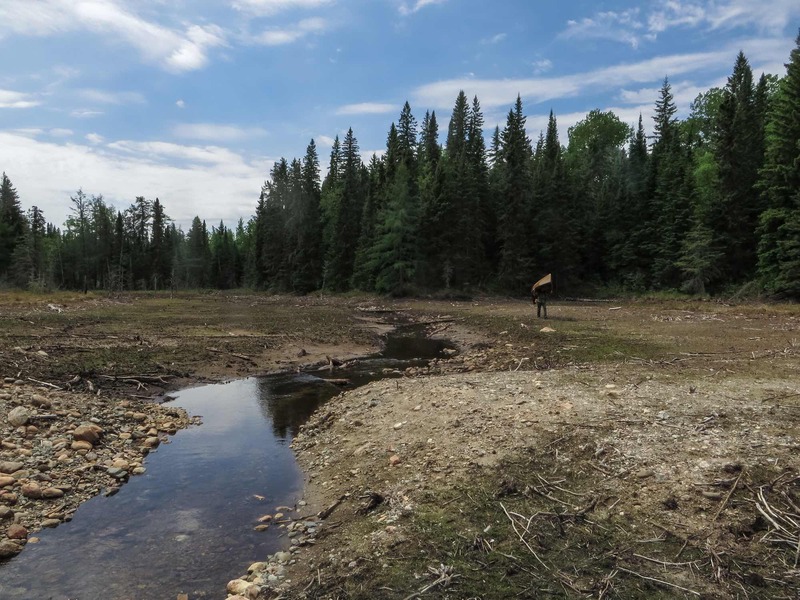 Somewhere near the end – it was 12:30 – we stopped for an hour, pulling out the lunch bag and our plush Helinox camp chairs and took a bit of a break. Once on Sunset Lake we celebrated the fact that from here on it would definitely be 65 kilometers of downhill to Missinaibi Lake at Whitefish Falls. And then – a shocker! Sitting on the lake as we entered were a couple of fishing boats! “What the …! How did they get here?” Well, the Austin Road passes the lake on its east shore and a few minutes later we would see their parked vehicles. We waved at them in the distance and headed to the north end of the lake where it narrows and does a sharp turn to the right. We knew there would be some complications to deal with! We spent a half-hour (2:00 to 2:30) on the rapids and blockages to the north of Sunset Lake where it makes that sharp turn to the east. 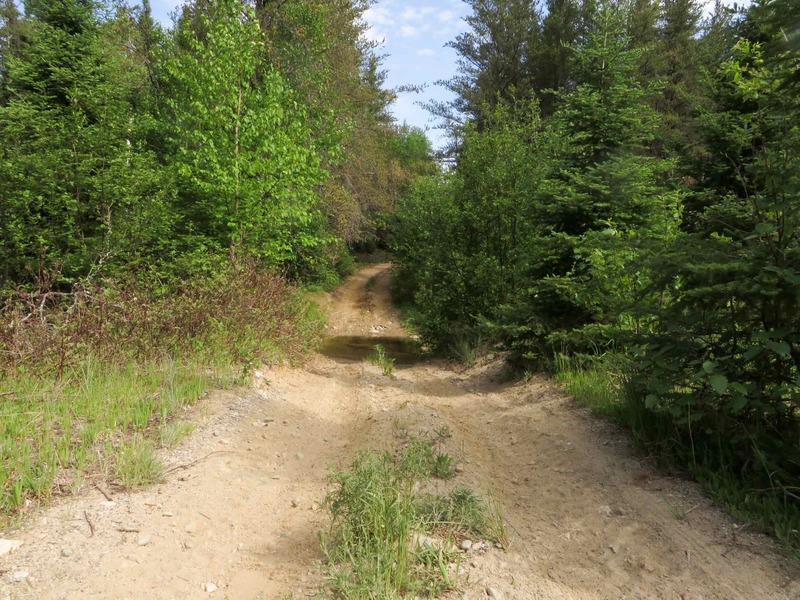 There was no trail to be found – what a surprise! – so we bushwhacked our way on river right to the bottom of the rapids. Along the way we did some trimming and marking of the new trail with prospector tape on the off-chance that some crazy canoe trippers would be coming through! We put in below the rapids out of Sunset Lake at 2:30. 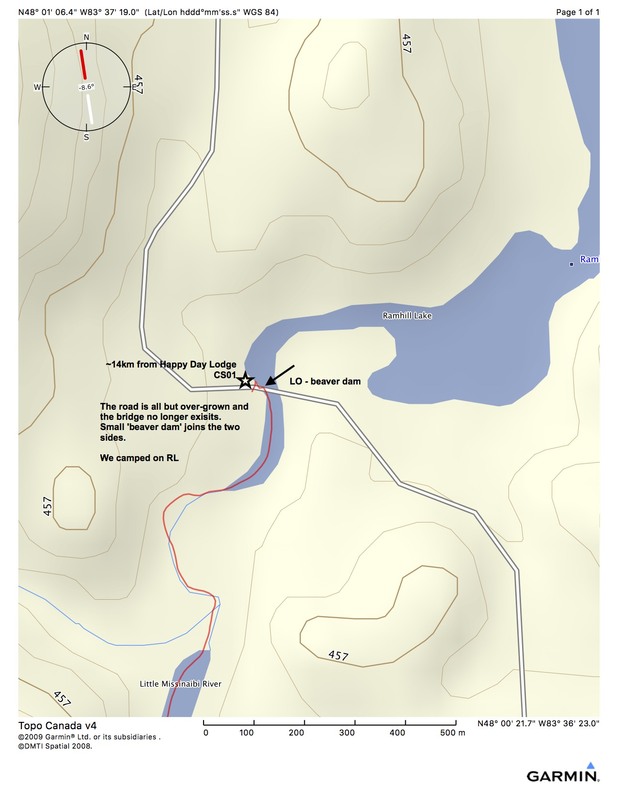 By 3:00 we had paddled the three kilometers down to the “road” as it crosses the river at the south end of Ramhill Lake. 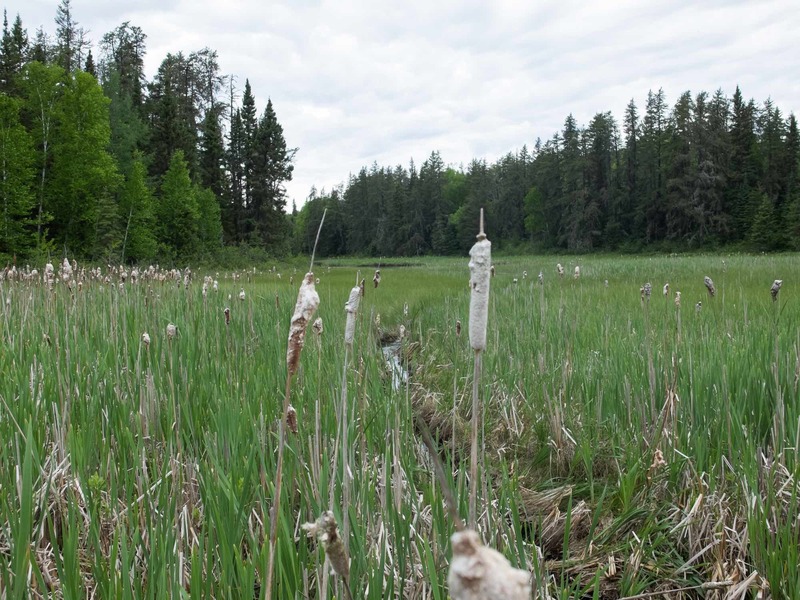 There is a definite wetlands feel to the area; it reminded us of the Peterbell marsh area on the Missinaibi River. 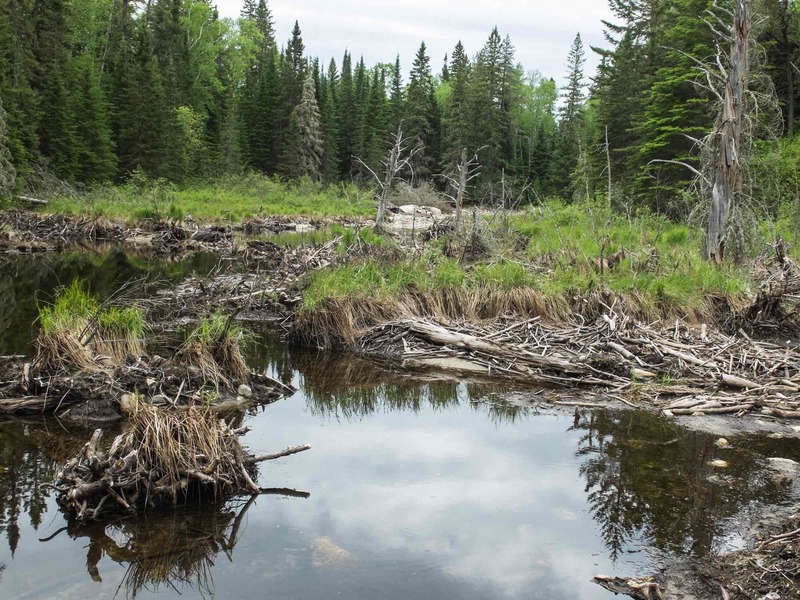 Three beaver dams presented the only interruptions to our easy paddling. 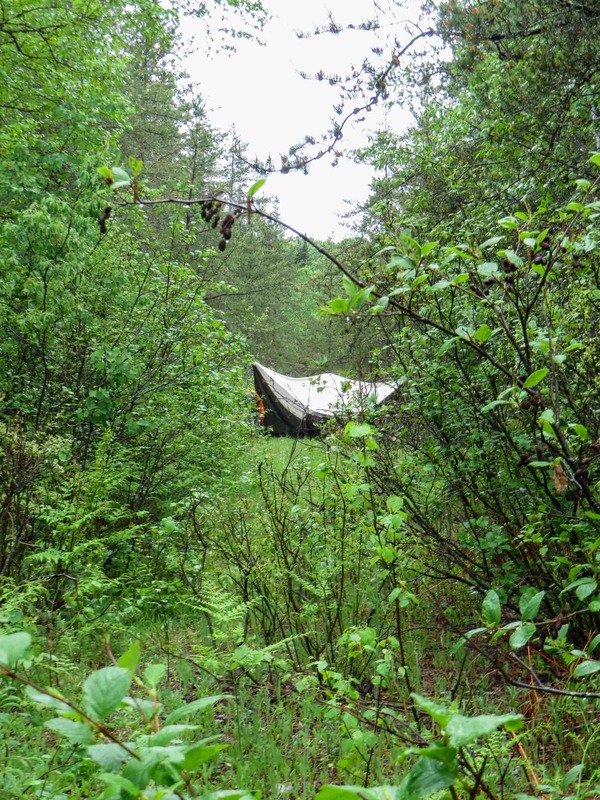 We set up camp on river left after clearing away some alders. A light rain had us setting up the Granny apple green silnylon über-tarp first and then putting up the tent underneath. 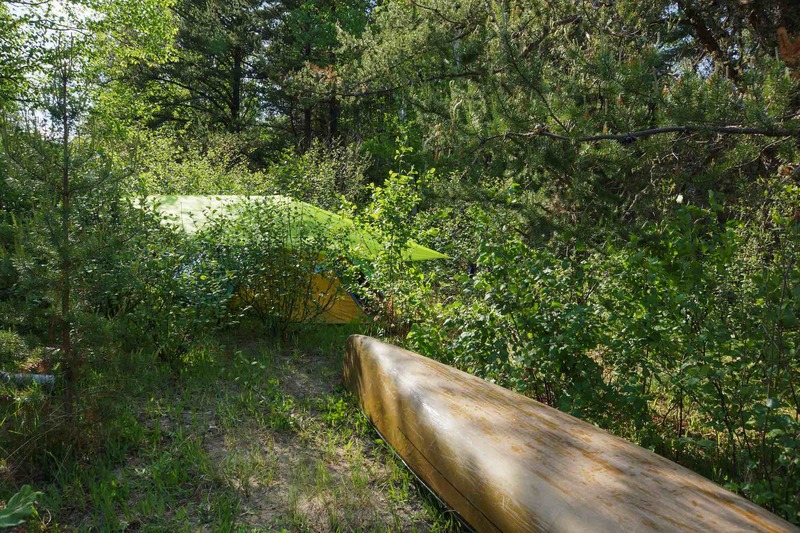 Some packs went underneath the overturned canoe and others into the vestibule areas on both sides of the tent. Then it started raining in earnest for a while so we had a late afternoon siesta, lulled into nap mode by the sound of the raindrops hitting the tarp. Later on the sun was back out and the day ended clear and sunny. 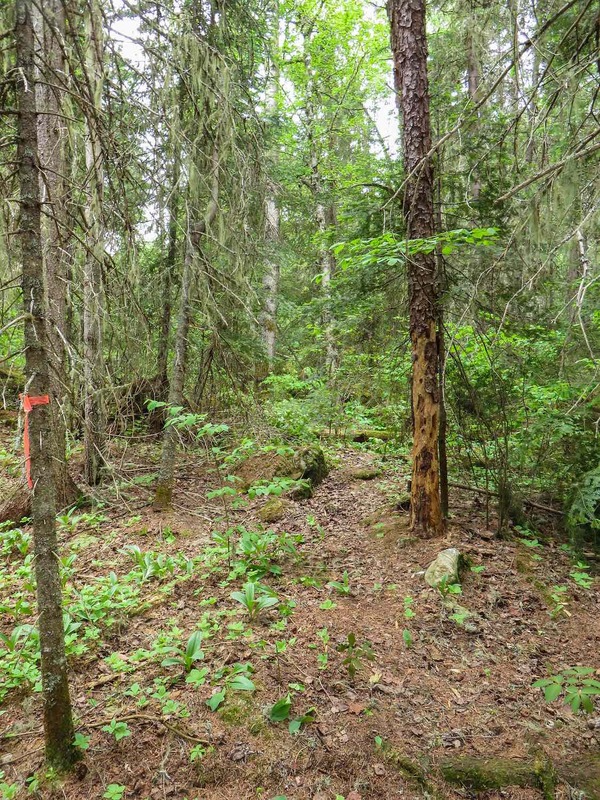 Thirty meters or so behind the tent on the remnants of the once-logging road we put up our new Eureka NoBugZone for the first time. 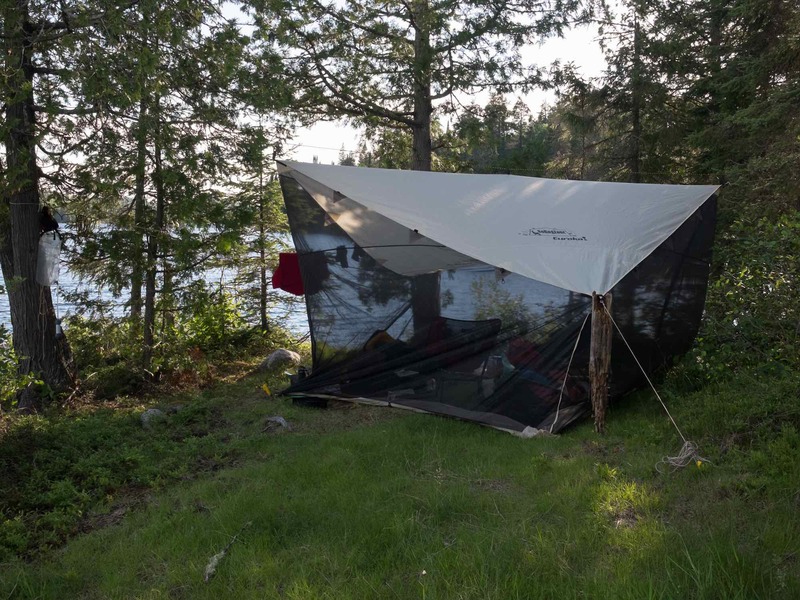 While we didn’t really need to – since the black flies and mosquitos were not really that bad – we figured it would be good to learn how to do it before the evening came when we really needed it up in a hurry! As you can see from the image below, it definitely looks like a first effort. It would take us a few set-ups before we caught on to the proper things to do and look for. Click here for the best set-up – it came seven nights later! our Eureka NoBugZone up for the first time – and looking like it! Day One had gone pretty much as expected. The 1:50,000 topo maps for Day Two promised a different kind of day as we left the wetlands and a negligible elevation drop to more dramatic drops in elevation. 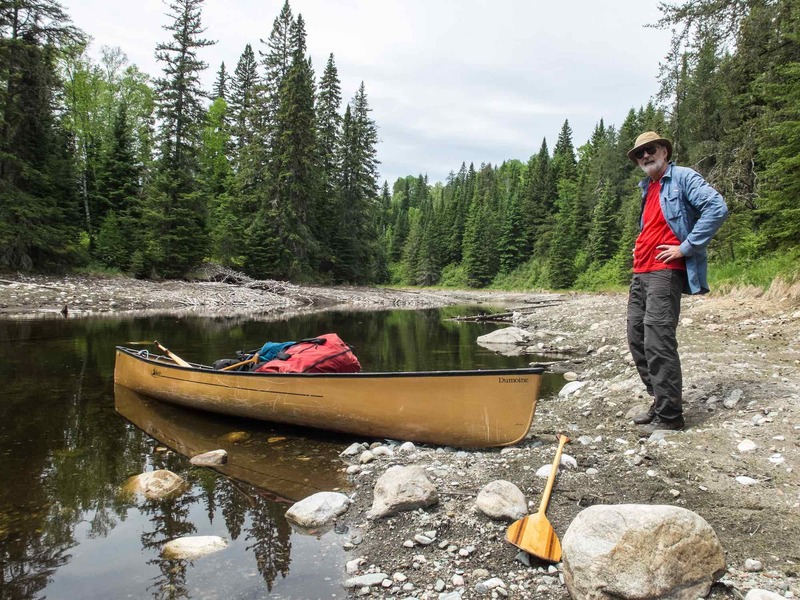 There would be some work to do as we continued down a section of the river that few – if any – canoe trippers have done lately. How much work we would soon find out! 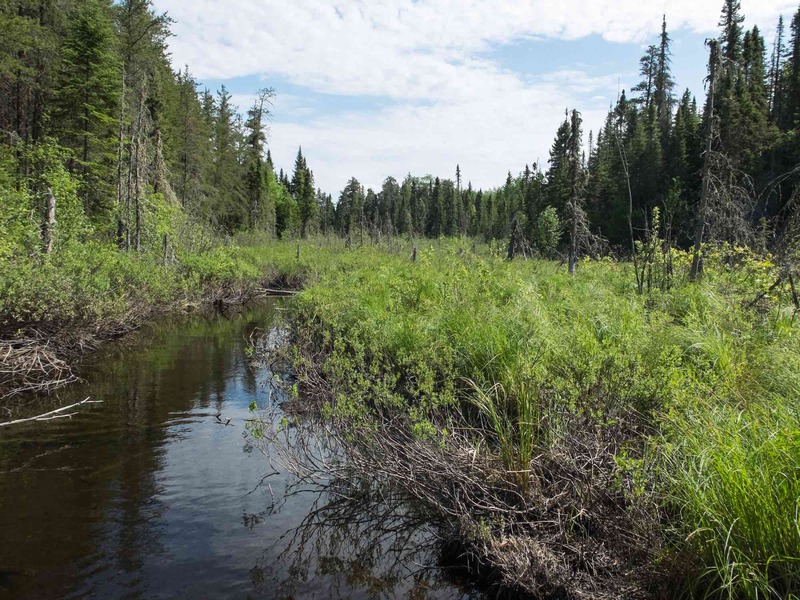 This entry was posted in wilderness canoe tripping and tagged Chapleau Game Preserve, Little Island Lake ontario, Little Missinaibi headwaters, Little missinaibi portages, Mackey Lake Ontario, Ramhill Lake Little Missinaibi, Rawhide Lake, Sunset Lake Sudbury District. Bookmark the permalink. 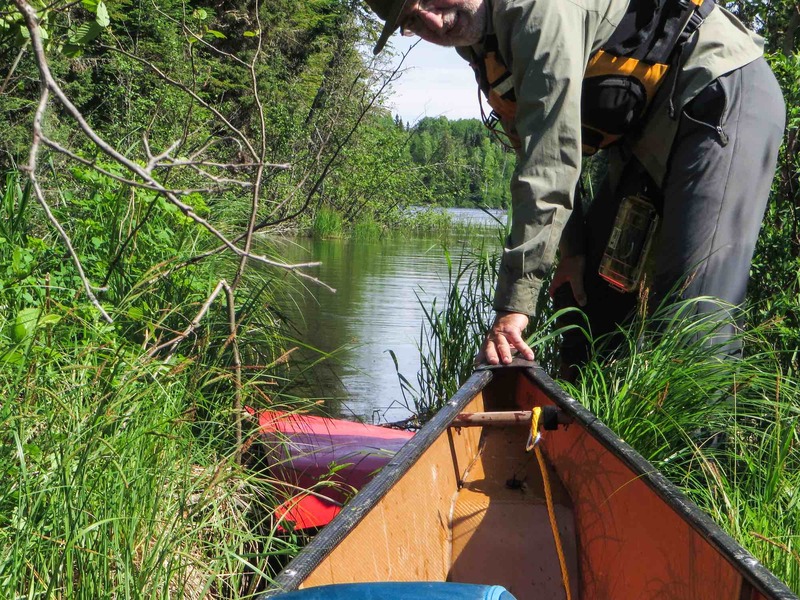 We usually avoid June canoe tripping because it is prime time for black flies. I figured the bug shelter would give us a refuge from the swarms of blood-seeking critters. It turned out to be nowhere near as bad as expected! We did appreciate the NoBugZone. It made the bugs a complete non-issue at nights and early mornings at breakfast. It weighs 5.5 lbs. It has been added to our 2 lbs each Helinox chairs as essential gear. The added comfort and peace of mind are worth the extra weight!